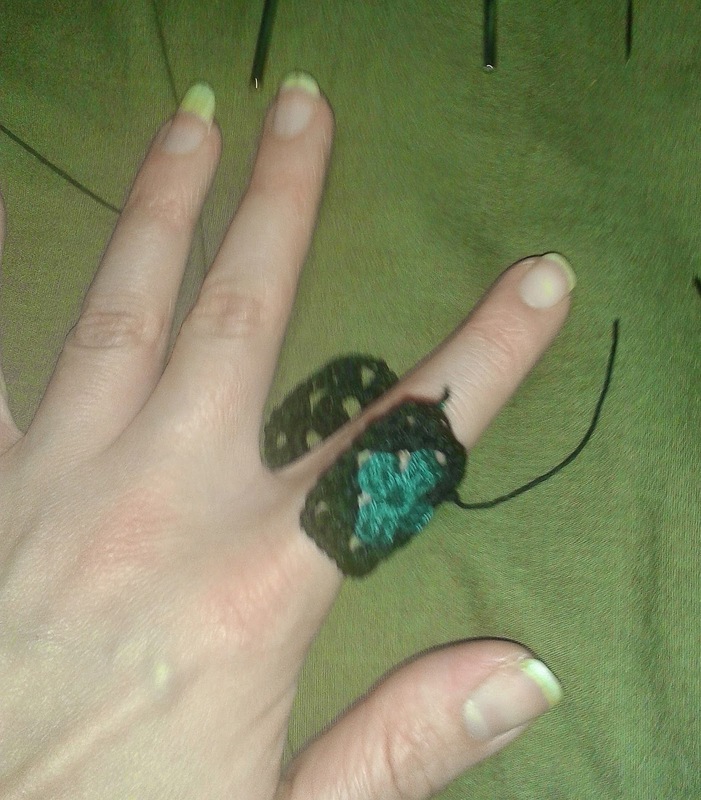 Here's a silly ring pattern for you today! I had some scraps laying around, really not much to make anything big, and had an "aha" moment. 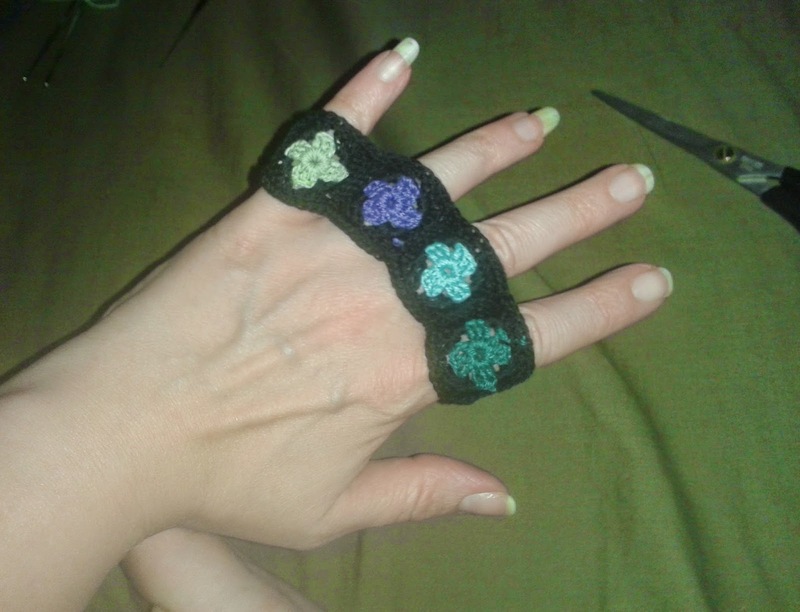 The 4 finger ring, in true granny square style. 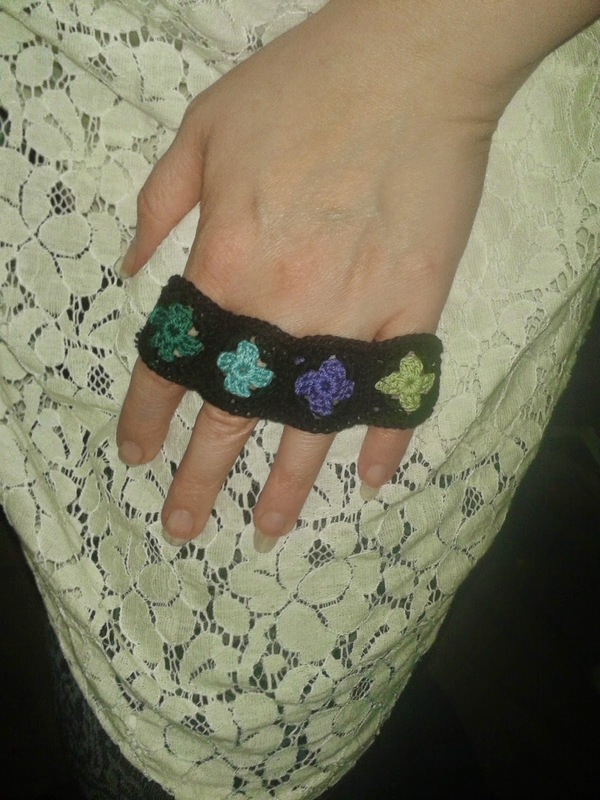 Materials: Small amounts of Aunt Lydia's Size 10 Cotton Crochet Thread, I used 5 different colors, main color was black which I used the most amount of, then very small amounts of forest green, turquoise, royal blue, and pale green. 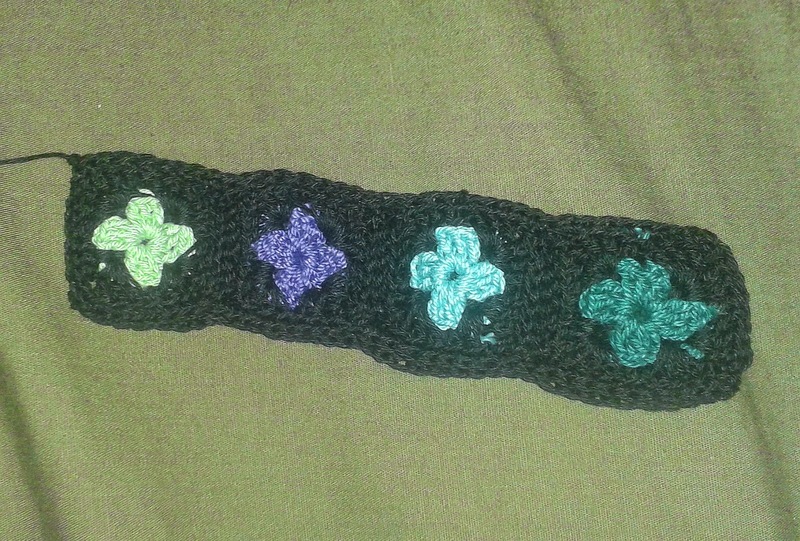 I used 4 different hook sizes. Index Finger-1.75mm, Middle Finger-1.25mm, Ring Finger-1.00mm, Pinkie Finger-0.75mm. 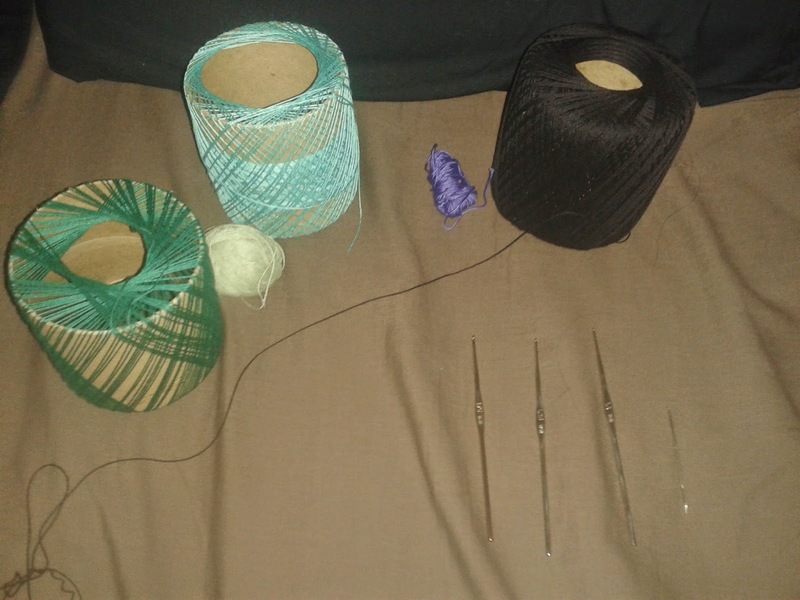 Have a large needle on hand to sew in your ends. 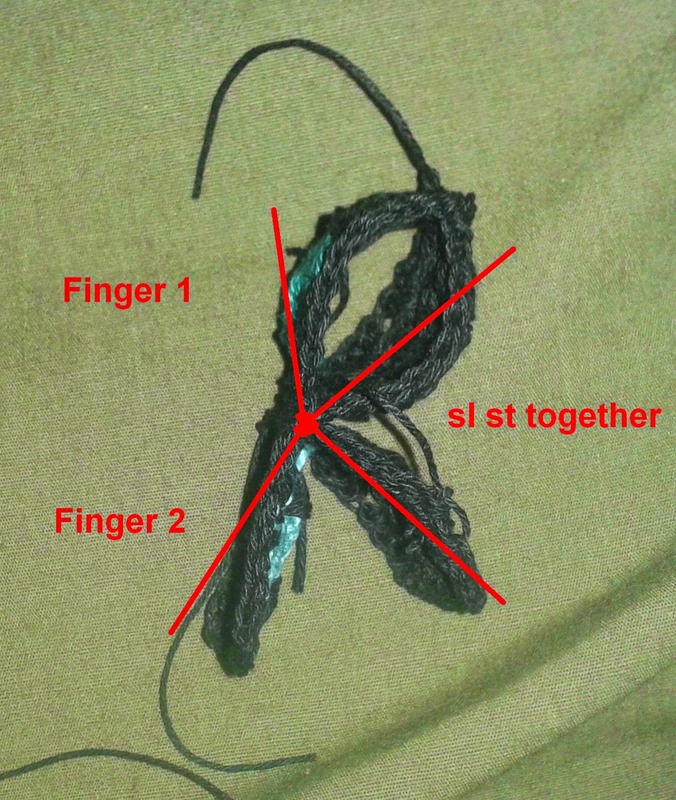 Photo shows 3 hooks, but I added the 0.75mm part way through. 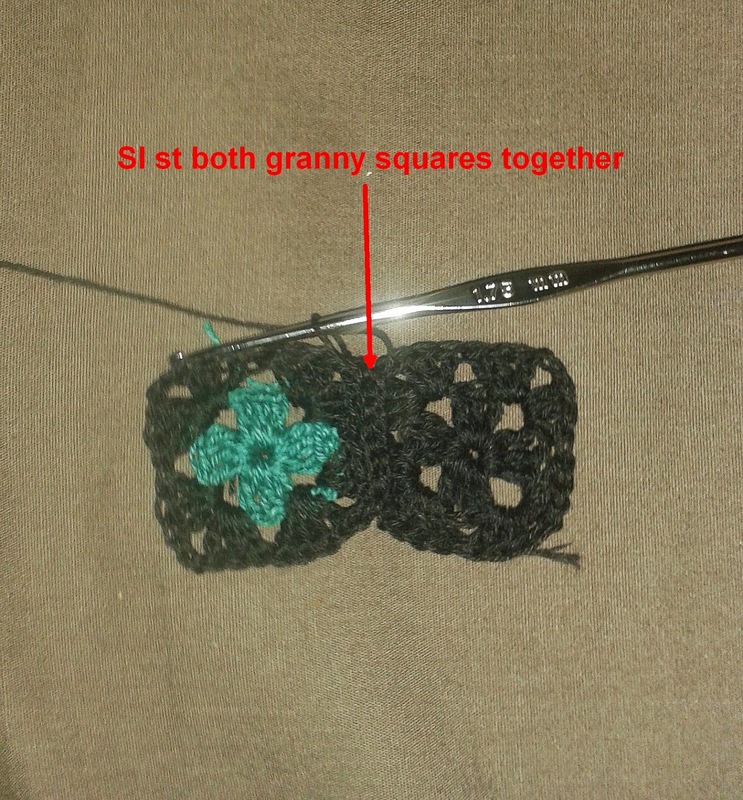 Skills Required: How to make a granny square, slip stitching motifs together instead of sewing, color changing, and hiding ends by crocheting over them. -ch5, sl st in 1st ch to form a loop. Rnd1: Ch5 (counts as 1dc and ch2 space), **3dc and ch2 inside loop** repeat 3 times, 2dc in loop, sl st to 3rd ch of beginning ch5. Rnd2: Sl st in 1st ch2 space, ch5, **3dc in same ch2 space, 3dc in next ch2 space, ch2(corner)**repeat 3 times, 3dc in same ch2 space, 2dc in last ch2 space, sl st to 3rd ch of beginning ch5. 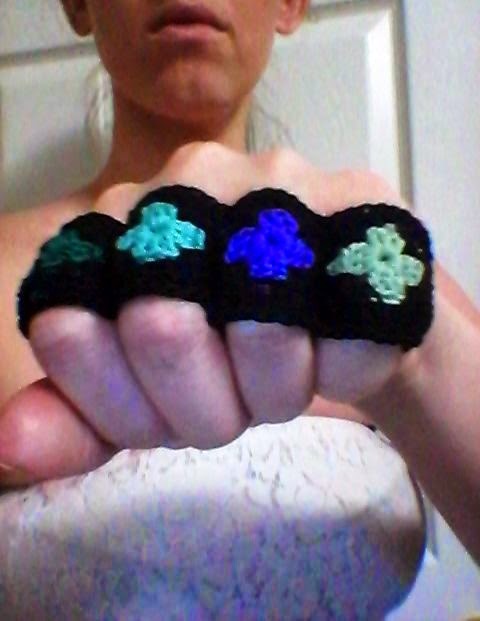 Same as Main Square, except you change color on the second round, and DO NOT fasten off! Make a MAIN SQUARE as before. Make a COLOR SQUARE as before. 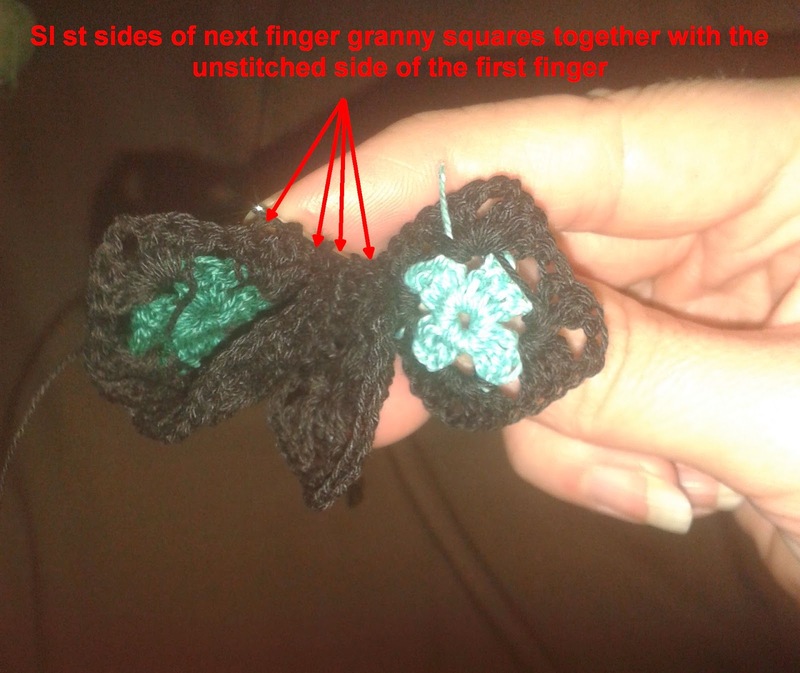 You are simply just attaching the 2 finger squares you just made to the first ring. 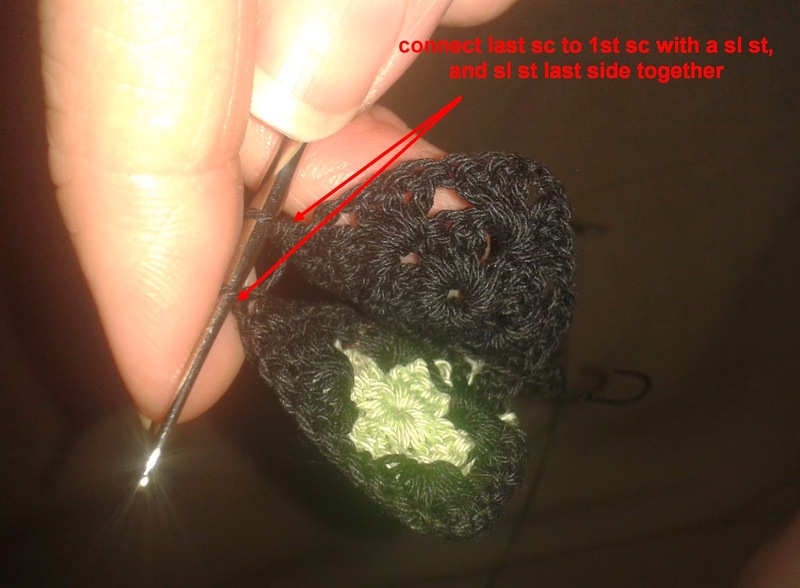 If you really don't get it, you can sew it together, however.. slip stitching them saves time and saves weaving in ends at the very end. 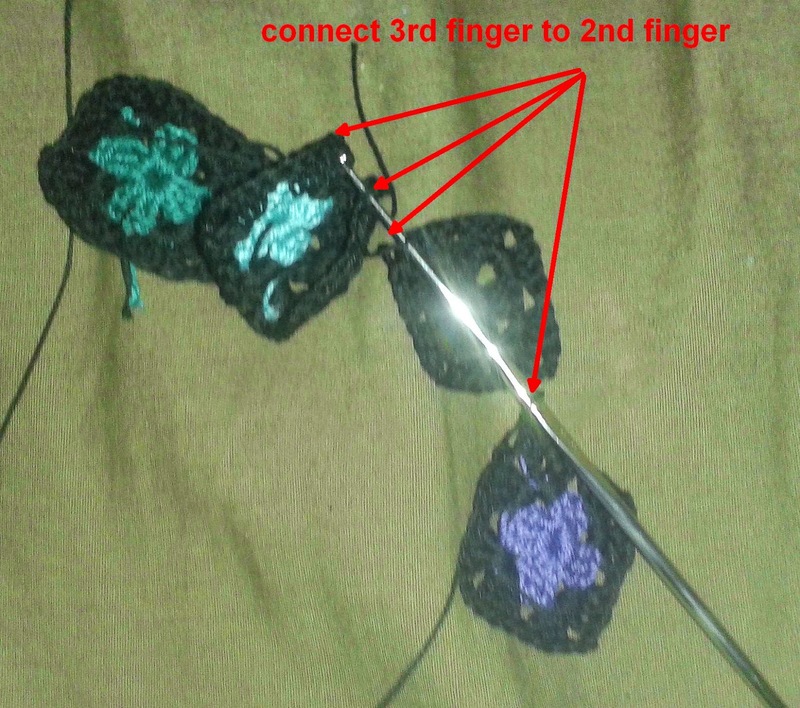 ATTACH: You are attaching these 2 squares like you did the last one, onto the open side of the Middle Finger. 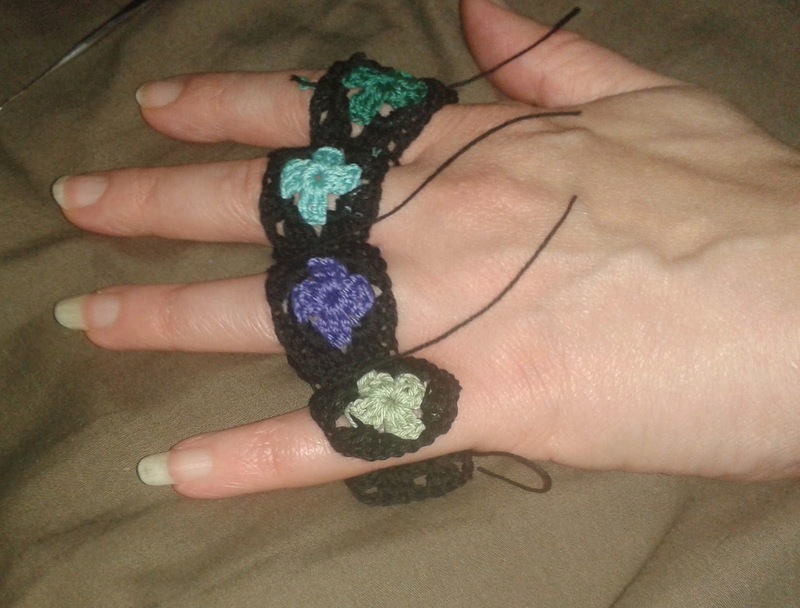 ATTACH: You are attaching these 2 squares like you did the last one, onto the open side of the Ring Finger. DO NOT fasten off. 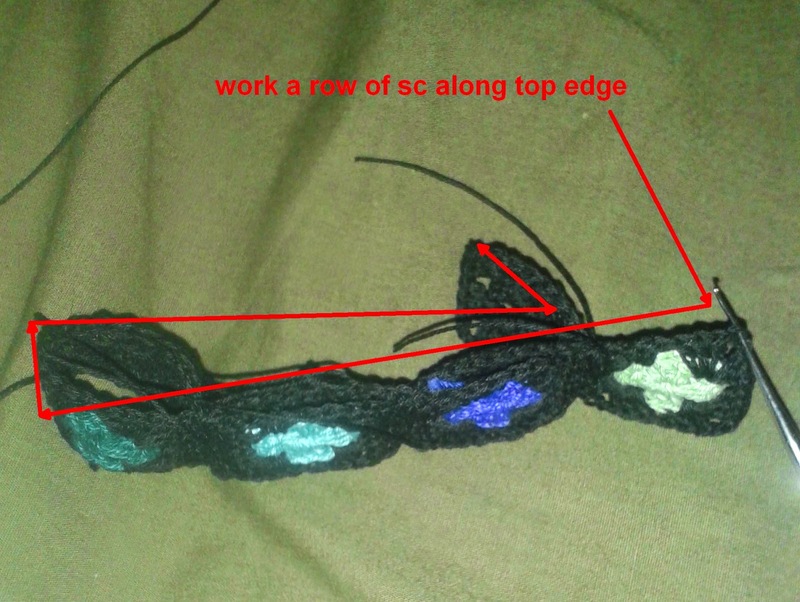 Now you are going to work a row of sc around both edges to clean it up and hide your thread tails. -ch1, sc in same sp, and work a sc in each dc and corner ch around to opposite side of edge. 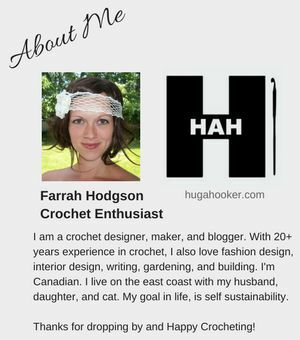 **Tip: hide any thread tails by single crocheting over them. 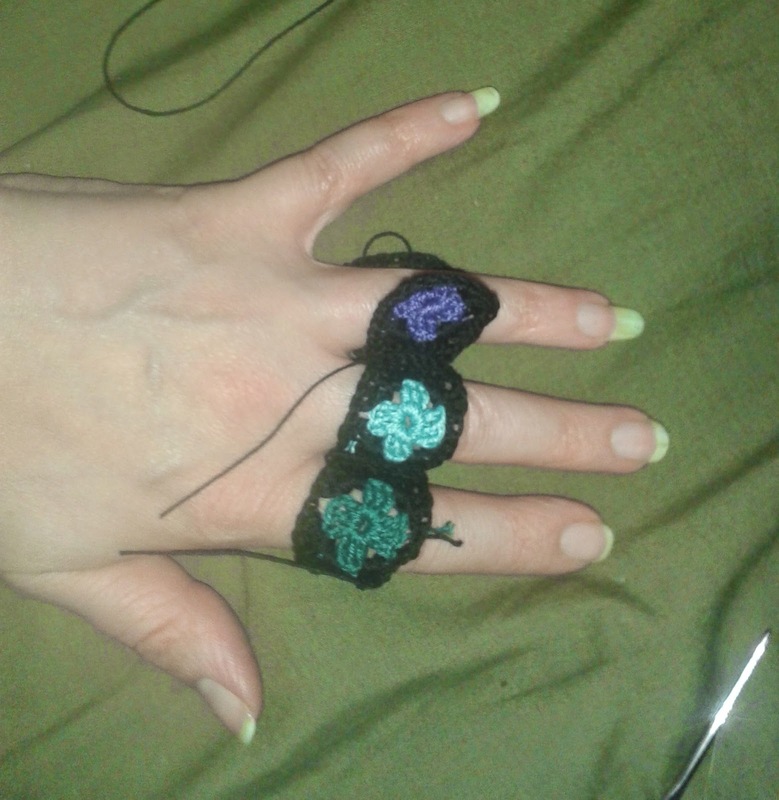 Slip stitch to the 1st sc of this row and slip stitch the last seam together of the pinkie finger, by lining up, right side facing you, I worked 8 sl sts through both sides. Now you are on the opposite edge, and ready to finish off with a row of sc. 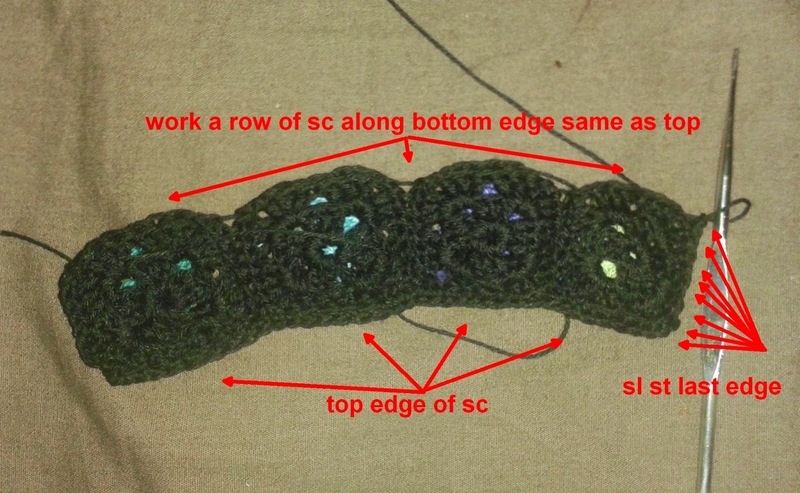 Ch1, sc in same st, work a row of sc around unfinished edge like you did the last edge, hiding any thread tails under this row. 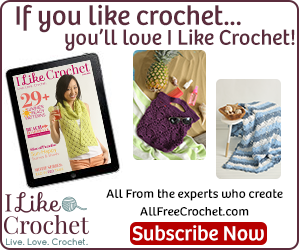 Sl st to 1st sc, and FASTEN OFF! 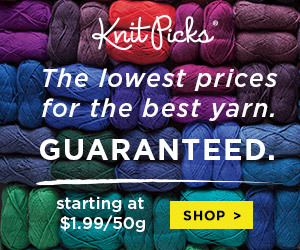 Now sew in your final tail. 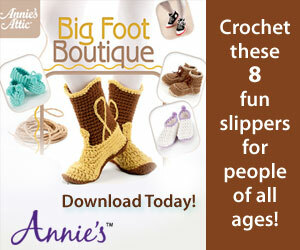 Ready to wear.